So, like the title says I just bought a 2019 Teryx which the dealer was nice enough to deliver. Went for my first trail ride outside the house and about a mile into it all the coolant suddenly dumped out with steam billowing through the floorboards. Called the dealer who stated they'd pick it up, no problem - except I had to get it to a road. So I ended up driving it back to the street (about a mile) with the red temp light on. 1) Anybody else experience this? I've read here about earlier year models having hose clamp issues, but seems odd for a new/current unit. 2) For the mechanically minded, any chance I warped the head(s) driving it back to the street? Didn't have a choice. 3) The machine still has less than 5 miles on it now. What impact will this have on motor longevity? Luckily all the worries are out of your hands on this one as the warranty should take care of it all, that being said did you hear the fan at all? ( clip not tightly installed or bad thermal switch) I’ve seen both happen on tubs, That would be my very first thought. Next would be water pump failure or debris caught in the impeller or a faulty thermostat. Fan was working because it was going nonstop on the ride back. Not sure about the other two possibilities. Dealer tech who picked it up mentioned this happened a few times with units due to a faulty or loose hose clamp, but I'm amazed if this was known by the factory and is still a problem today. I know it'll be 'fixed' by warranty, but I'm curious about engine longevity now and of course there's the frustration of spending quite a bit of money on a vehicle that couldn't even go a mile. Saddest part is I've been riding Kawi motorcycle for literally decades...never anticipated this type of issue from them. While I was putting on my new JBS skids , I checked all of the hose clamps on my '17 (whenever I first bought it) . I got at least a full turn on EVERY clamp (coolant and air intake) . I found a small puddle of coolant under my '15 on the second day of ownership due to a loose hose clamp (the one by the oil dipstick). Over the years I have seen several other posts with the same issues. It's really not that hard to set a system in place in a the factory to avoid having the hose clamps loose (I worked in the automotive industry for years). For long term engine concerns I understand where you are coming from. If you stopped and turned the engine off shortly after the coolant dumped out, let it sit for awhile when calling and talking to the dealership, and then went and limped it a mile back to the road I wouldn't be too concerned. Similar issue. 2019 2 hours on engine. Dumped coolant in a stream in my driveway. Back to the dealer and in the shop. They told me about the hose clamp issue. I said no, as I had pulled the skid plate and checked for obvious things like that. Turns out the water pump shaft was missing the c-clip on the engine side of the shaft, causing too much play in the shaft (first clue of the problem, after removing cover plate), allowing leakage past the seal. 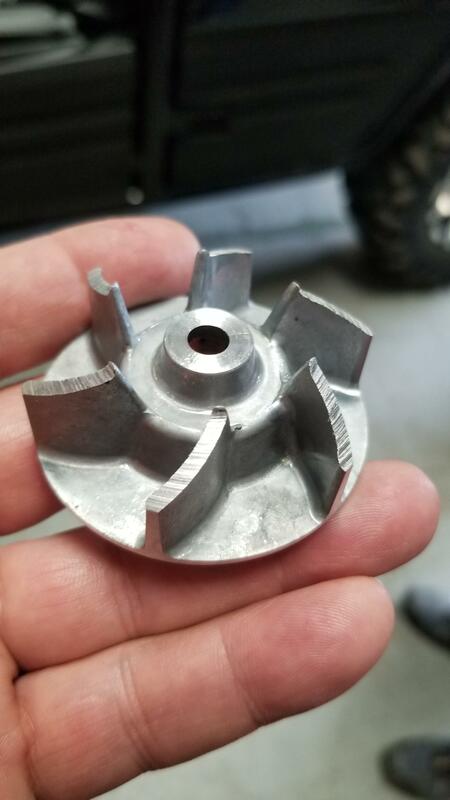 Also the impeller ground itself into the cover plate, causing serious damage to impeller and the cover. Fix was to replace the entire water pump assembly. All covered under warranty. Factory engine assembly failure.